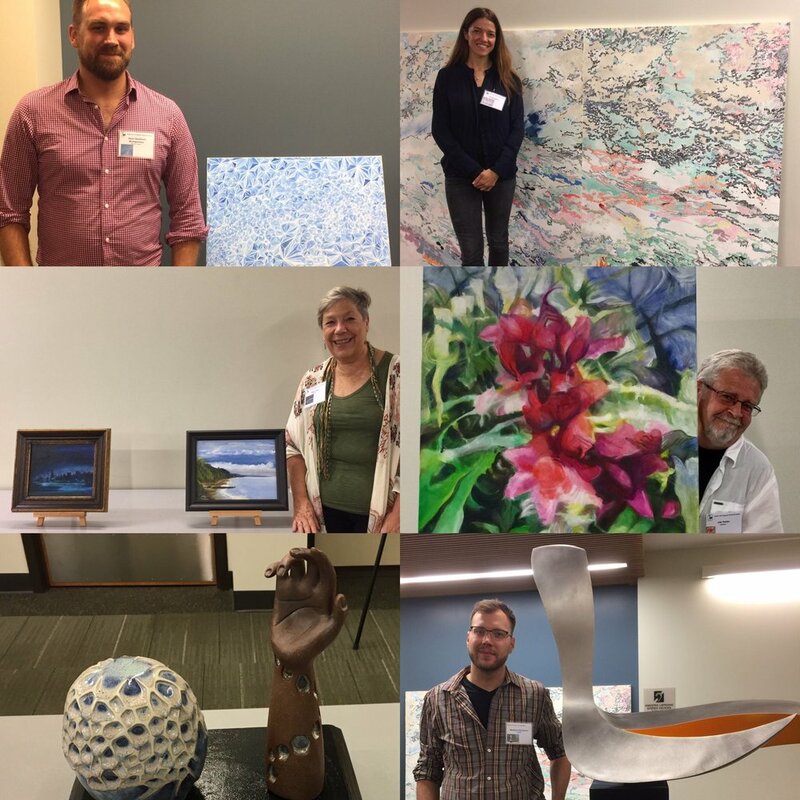 As a follow up to my article two weeks ago, Questions for Artists, we had a wonderful Open House and Meet the Artist event last week. This event is for artists in our annual Public Art Program. Every July, artists from our community and beyond submit images and descriptions of their art work for the Fine Arts Commission's review. The Commission selects the art we would like to display for the year in our public buildings like the Village Hall, Library and Park District. We received over 50 art submissions for review from 27 different artists from around the country. This year we selected 24 artworks from 16 artists. At this Open House, we invite the selected artists and the community to see all the art displayed together at our public library. After the Open House, the art is transported to the public building where it will reside for a year. This event is to help promote artists and really, the arts in general. To help the artists gain a wider audience, it seemed the Commission could facilitate the audience getting to know the artists better. One way to get to know the artists is to ask some questions at the Open House in a Meet the Artist event. These discussions provide a focus on the artwork and allow us to get to know the people who made it. I am so grateful for all the artists sharing their art and their stories with us. It was a pleasure to get to know the artists in person or by their written submissions to our three questions for the night. The good news is that the questions really just provided a structure for a conversation with the artist since once they got rolling, they talked about things that were important to them as artists. My job as the interviewer for the Meet the Artist event is to help the audience get to know more about both the artist and their story. We learned about what makes each of them unique as an artist. Everyone spoke (or wrote) so eloquently about what they were communicating through their art. It was fascinating and the hour flew by. The three questions gave us a starting point for conversation and I noticed some patterns. Many of the artists felt like they've always been creative ever since they were children. Some artists took up art later in life and their enthusiasm and joy for it was infectious. They seem very prolific as if they were making up for lost time. Another common theme is about the emotion evoked by their art. Many of the artists said they felt their art evoked a feeling of happiness or joy. One artist thought her art evoked a sense of calm due to her nature themes. Some thought it was up to the viewer what they saw in their art. They had no preconceived notions. However when I asked her what she felt looking at her art, it was about expansion and vitality. I agreed. I particularly love these discussions about the emotion associated with their art because it makes us all realize Art is about so much more than just the technique, the colors or the materials used. Art is important because of how it makes us feel. As for what they are working on, several of the artists were focussing on public art to make art accessible to more people, an issue our Commission thinks is important as well. Some artists were working on new series of work which they shared with us. One artist paints plein-air every weekend she can with a group of other artists. One artist shared about her creative process as a sculptor and how she sees the model but her imagination allows her to see this figure as if it were interacting with another. Another sculptor talked about how his use of metal materials help him make the sharp edges he wants in his art. I wish I could recall more specifics of what they said because they each were so open and honest. It felt very special that way, a conversation of true substance. I am providing a list of the artists in our Public Art Program this year. If they have a website I have included it as a link. Just click on the name to check out their art. As an aside, it was wonderful to see the artists connecting with each other at the Open House. Fostering connection and support amongst artists is a great outcome of this project. So my advice, next time you meet an artist, ask them these simple questions like why did you become an artist, what are you working on now, etc. The answers are never simple but get right to the heart of the matter, why people do the things that they do.